X-rays use low doses of radiation to create pictures of the inside of your body. If you have a symptom or your screening test result suggests cancer, the doctor must find out whether it is due to cancer or some other cause. 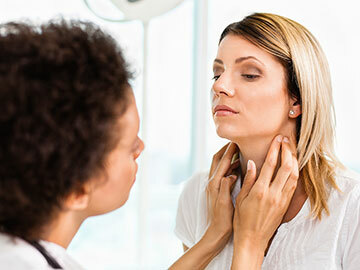 The doctor may ask about your personal and family medical history and do a physical exam. The doctor also may order lab tests, scans, or other tests or procedures. High or low levels of certain substances in your body can be a sign of cancer. So, lab tests of the blood, urine, or other body fluids that measure these substances can help doctors make a diagnosis. However, abnormal lab results are not a sure sign of cancer. Lab tests are an important tool, but doctors cannot rely on them alone to diagnose cancer. An x-ray machine linked to a computer takes a series of detailed pictures of your organs. You may receive a dye or other contrast material to highlight areas inside the body. Contrast material helps make these pictures easier to read. For this scan, you receive an injection of a small amount of radioactive material, which is sometimes called a tracer. It flows through your bloodstream and collects in certain bones or organs. A machine called a scanner detects and measures the radioactivity. The scanner creates pictures of bones or organs on a computer screen or on film. Your body gets rid of the radioactive substance quickly. This type of scan may also be called radionuclide scan. An ultrasound device sends out sound waves that people cannot hear. The waves bounce off tissues inside your body like an echo. A computer uses these echoes to create a picture of areas inside your body. This picture is called a sonogram. A strong magnet linked to a computer is used to make detailed pictures of areas in your body. Your doctor can view these pictures on a monitor and print them on film. For this scan, you receive an injection of a tracer. Then, a machine makes 3-D pictures that show where the tracer collects in the body. These scans show how organs and tissues are working. With a needle: The doctor uses a needle to withdraw tissue or fluid. With an endoscope: The doctor looks at areas inside the body using a thin, lighted tube called an endoscope. The scope is inserted through a natural opening, such as the mouth. Then, the doctor uses a special tool to remove tissue or cells through the tube. With surgery: Surgery may be excisional or incisional. In an excisional biopsy, the surgeon removes the entire tumor. Often some of the normal tissue around the tumor also is removed. In an incisional biopsy, the surgeon removes just part of the tumor. If you have symptoms that last for a couple of weeks, it is important to see a doctor. Most often, these symptoms are not due to cancer. They may also be caused by benign tumors or other problems. If you have symptoms that last for a couple of weeks, it is important to see a doctor so that problems can be diagnosed and treated as early as possible. Usually, early cancer does not cause pain. If you have symptoms, do not wait to feel pain before seeing a doctor. To learn more about symptoms for a specific cancer, see the PDQ® cancer treatment summaries for adult and childhood cancers. These summaries include information about symptoms. Mark Truty, M.D., a Mayo Clinic surgeon specialized in treatment of pancreatic cancer, discusses the evaluation, diagnosis, and treatment of pancreatic cancer. Dr. Truty emphasizes that in 2013; approximately 45,000 patients were diagnosed with pancreatic cancer. Today, with Mayo Clinic’s research and modern approach to multimodal surgical management of pancreatic cancer, patients who previously may have had very little hope, now have a greater chance of long-term survival.